9. October 2018. - 13. January 2019. The exhibition of almost ninety pictures will portray one of the most pronouncedly individual periods of modern British art, longest-lasting in its influence and bringing together excellent artists. 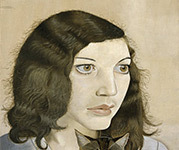 It seeks to show how these painters conveyed their personal, sensual, momentary and often extremely intense experiences. 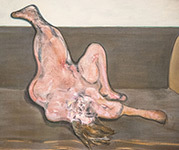 The selection to be seen comprises works by outstanding artists – Lucian Freud, Francis Bacon and others – taking viewers on a journey from the early 20th century until today. Significant and rarely exhibited paintings will be loaned by European and overseas private collectors and public collections, while a part of the works will arrive in Budapest from the Tate Gallery in London. The story of a century related by the exhibition is intricate yet simple and gripping; with its main focus being the highly influential paintings of Lucian Freud and Francis Bacon, it will also showcase artists active at the same time. It will bring alive the quality and force of individual works, while highlighting the profound dialogue between the artists and the links between some of the compositions from the second half of the 20th century. Despite their obvious differences, the artists presented – Michael Andrews, Frank Auerbach, R. B. Kitaj, Leon Kossoff, Paula Rego, F. N. Souza and Euan Uglow – remained faithful to the intimate and powerful depiction of the human figure and their own everyday landscape. The selection will also revisit the oeuvres of previous generations, whose art is integral to understanding the intimate, subjective and tangible depiction of reality. Works by Walter Richard Sickert, David Bomberg, Alberto Giacometti, Chaim Soutine, Stanley Spencer and William Coldstream will help visitors gain an insight into the School of London now placed in a broader time frame and more international context than before. This is also why the material will include Jenny Saville and Cecily Brown, members of the young generation working to continue this tradition.